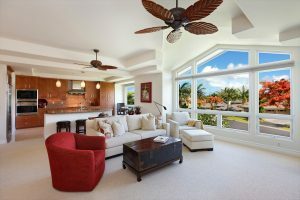 The median price of a single-family home on Kauai fell 17 percent last month as the number of homes dropped by more than 50 percent, compared to a year ago, while the median price of a Garden Island condominium rose by 18 percent despite fewer sales, according to statistics from Hawaii Information Service on behalf of Kauai Island Realtors. The median price of a single-family home on Kauai in March was $629,900, which was a decline of 16.9 percent from $758,000 during the same month last year. That was based on sales of 29 homes, which was a drop of 54.69 percent from 64 homes sold in March 2018. The median price of a condo on Kauai in March was $521,750, which was an increase of 18.18 percent from $441,500 last year. That was based on sales of 34 units, a drop of 22.73 percent from 44 units sold in March 2018. 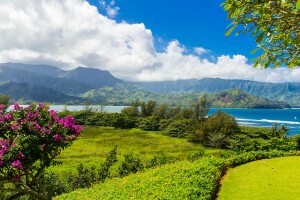 This entry was posted in Kauai Information, Kauai Real Estate on April 8, 2019 by Hawaii Property. Elevated above Kapaa town, close to the bypass yet enjoying a country setting, this two-story home is situated in a newer neighborhood and perfect for a large family. It features five spacious bedrooms, four of which have en suite full bathrooms, as well as two additional 3/4 baths. The property also boasts spectacular mountain and waterfall views. Along with an expansive kitchen, the home provides two living areas, one on the upper level and one on the lower. For added flexibility, it has a bonus room with ocean views, which could be used as an office, playroom, craft room, or home gym. A wrap-around covered lanai faces the ocean, offering beautiful views of the sunrise and the Pacific. Flowering shower trees line the driveway leading to the home, and the property also includes numerous avocado trees. A three-car garage and an agricultural building (currently used as caretakers’ quarters) create additional options for storage. Avoid the “Kapaa crawl” on your commute to Lihue from this move-in-ready residence. Please contact Donna Rice for additional information. This entry was posted in Kauai Real Estate on March 3, 2019 by Hawaii Property. “This was a place I always wanted to come to visit,” he said. 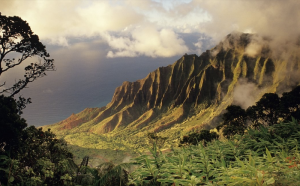 “My wife’s former co-workers retired to winter on Kauai and kept inviting us to visit.”Kauai welcomed a record number of visitors like Phillips in 2018. This entry was posted in Kauai Real Estate on February 16, 2019 by Hawaii Property. 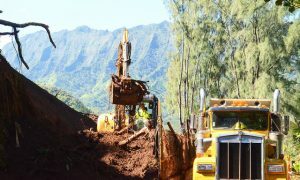 WAINIHA — Construction crews are working overtime to repair Kuhio Highway on the North Shore, and state transportation department officials are confident they will meet their goal of reopening the road past the checkpoint by the end of April. Ed Sniffen, Hawaii Department of Transportation deputy director of the Highways Division, said Thursday he is “absolutely” confident work will be completed to allow two-lane traffic past the Waikoko checkpoint at Anae Road in Wainiha. “Our goal is to get this thing done,” Sniffen said during an interview at the checkpoint, after checking progress at construction zones along the highway in Wainiha and Haena with several other HDOT officials Thursday afternoon. The North Shore was devastated during the flooding on April 14 and 15, brought on by nearly 50 inches of rain. Much of the highway was washed out, homes were destroyed, cars carried away by rising waters and property was damaged. The recovery for many in the area continues. There was also extensive damage to Haena State Park and Napali Coast State Wilderness Park, both of which remain closed to visitors. The convoy system between Wainiha and Waikoko will continue to operate until HDOT determines it is safe to allow access without it. Sniffen said he has more faith in the April estimate than he had in the October deadline decided upon last summer. “The reasons for the deadlines in the past was to make sure that we looked at the end of the year to see what problems we might encounter,” he said, explaining that previous goals were based on an incomplete understanding of the situation and had to be modified when new information came to light. “So those start pushing the deadlines out. The rains that we get, the normal storms that we get, we always gotta figure those in. And I think April is a good timeframe,” Sniffen said. “As we found more material that we saw was destabilized, we had to start excavating that out, too. So the scope of the project got bigger and bigger the more we excavated,” Sniffen said. “When we started looking at the roadway, itself, we could have just said, ‘Let’s clear the landslide. Let’s clear the upper slopes, and be done with it.’ But if we did that, this project would have taken much, much longer, not just for the state side but for the county side as well,” he said. Reopening the road earlier, Sniffen said, would have forced construction crews to work in limited space and would not have allowed for the load capacity of the North Shore’s three bridges to be increased so that heavy machinery and equipment could not reach the areas where they are needed. “The big thing that I want to make sure everyone knows, is we could have stopped at just clearing the debris,” Sniffen said. “And the federal government could have not supported us in helping us out with the bridges. Although the end is in sight, the future of the North Shore remains uncertain. Erosion on the makai side of the highway poses a long-term threat to the stability of the road, a problem that, so far, is being dealt with on a patchwork basis. “Right now we don’t know what the permanent solution is,” Sniffen said, pointing out that the problem will only be further exacerbated as sea levels continue to rise. National Oceanic and Atmospheric Administration scientists in 2012 conducted a review of the research on global sea level rise projections, and concluded that the average sea levels will likely rise at least 8 inches by 2100 and could potentially rise by as much as 6.6 feet. “If we’re looking for a sustainable location for this roadway — if we see a one-meter rise — this is probably not it,” Sniffen said. For now, according to Sniffen, HDOT engineers and administrators are trying to delay erosion and maintain the existing infrastructure long enough to buy researchers time to develop a viable solution. This entry was posted in Kauai Real Estate on February 11, 2019 by Hawaii Property.